1.7MW and 1.2MW installations will provide equivalent power for roughly 920 average households. 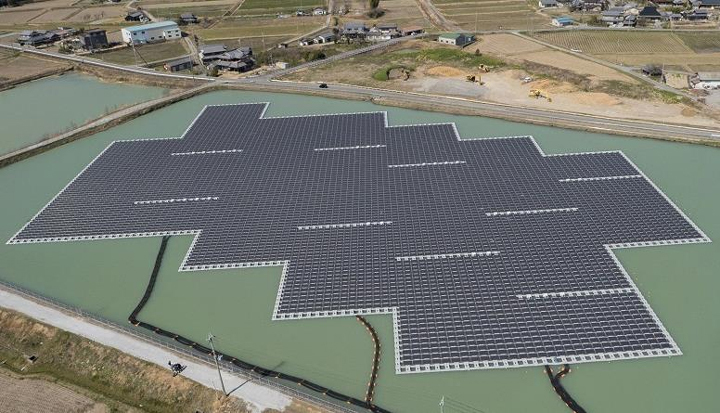 Kyocera Corporation (President: Goro Yamaguchi; herein "Kyocera,") and Century Tokyo Leasing Corporation (President: Shunichi Asada; herein "Century Tokyo Leasing") announced today that Kyocera TCL Solar LLC, a joint venture established by the two companies, has completed construction of two floating mega-solar power plants at Nishihira Pond and Higashihira Pond in Kato City, Hyogo Prefecture, Japan. The plants, inaugurated in late March, will generate an estimated 3,300 megawatt hours (MWh) per year in total-- enough electricity to power approximately 920 typical households*. Electricity generated will be sold to the local utility (The Kansai Electric Power Co., Inc.) through Japan's feed-in-tariff system. 2. They reduce reservoir water evaporation and algae growth by shading the water. Kyocera Corporation (NYSE:KYO)(TOKYO:6971), the parent and global headquarters of the Kyocera Group, was founded in 1959 as a producer of fine ceramics (also known as “advanced ceramics”). By combining these engineered materials with metals and integrating them with other technologies, Kyocera has become a leading supplier of electronic components, printers, copiers, solar power generating systems, mobile phones, semiconductor packages, cutting tools and industrial ceramics. During the year ended March 31, 2014, the company’s net sales totaled 1.45 trillion yen (approx. USD14.1 billion). Kyocera appears on the latest listing of the “Top 100 Global Innovators” by Thomson Reuters, and is ranked #531 on Forbes magazine’s current “Global 2000” listing of the world’s largest publicly traded companies.